These are my Jaywalker socks. Jaywalker is a free pattern by Grumperina and is available on Ravelry. The pattern is very easy to memorize, it comes in a few sizes and I’m definitely going to make another pair in the correct size for me. I made them out of Knit Picks Felici in the Mixed Berries colourway (now discontinued – I wish I had bought more!). 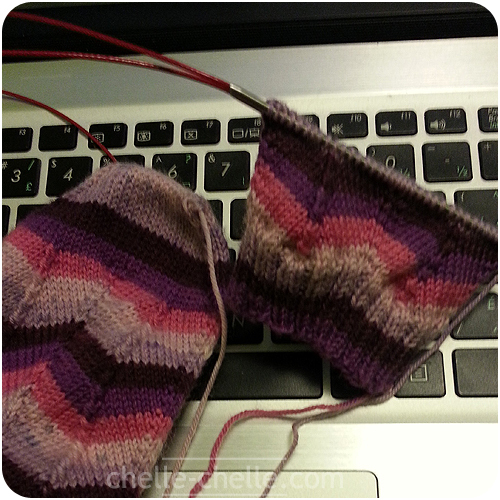 These are knit on size 2.25mm needles (US 1) using my Chiaogoo circulars – love them! 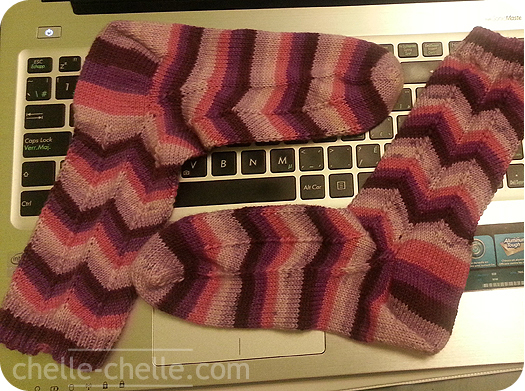 I did them with magic loop and did the heel as written (heel flap & gusset). Unfortunately, they are just too small for me, so these are destined to be my mom’s Christmas gift this year.